The Valor 4 features an Easy-to-Read LCD console, displaying important workout statistics as you exercise - speed, distance, time, calories burned, watts and heart rate. Cross training is an excellent way to target muscle groups in the lower body, however feel free to transform your routine into a full body workout using the Upper Body Arms function. 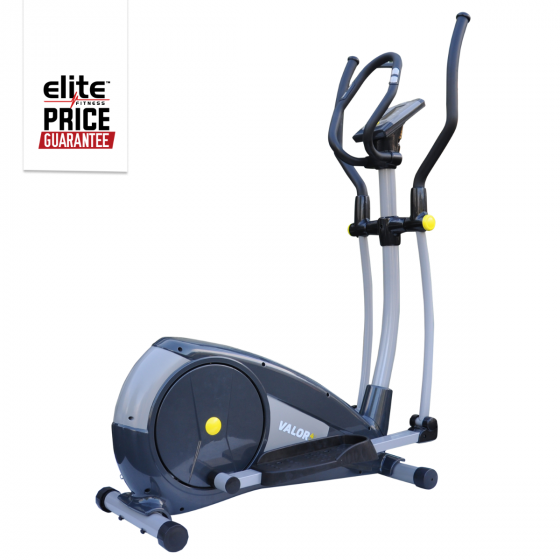 With a 6kg Heavy Precision Balanced Flywheel and 12' Stride, the Valor 4 offers a swift, smooth movement. Tone arms, legs and glutes with one machine! 16 levels of Silent Magnetic Resistance and 16 Workout Programs will ensure you stay motivated to reach your fitness goals! Console: LCD Console: Displaying valuable feedback including; Time, Distance, Calories, Watts & Heart Rate. Programs: 16 Built-in Workout Programs. Flywheel: 6kg Heavy Precision Balanced Flywheel. Stride Length: 12" stride activates the most muscle within the elliptical motion. Resistance: 16 Levels of Magnetic Resistance. Rear Drive System: Creates a smaller footprint and takes up less space. Non-Slip Foot Plates: Feel comfortable and safe while you work out. Upper Body Workout Arms: Push and pull on the moving arms to get a great upper body work out. Transport Wheels: Makes for easy moving and storage.